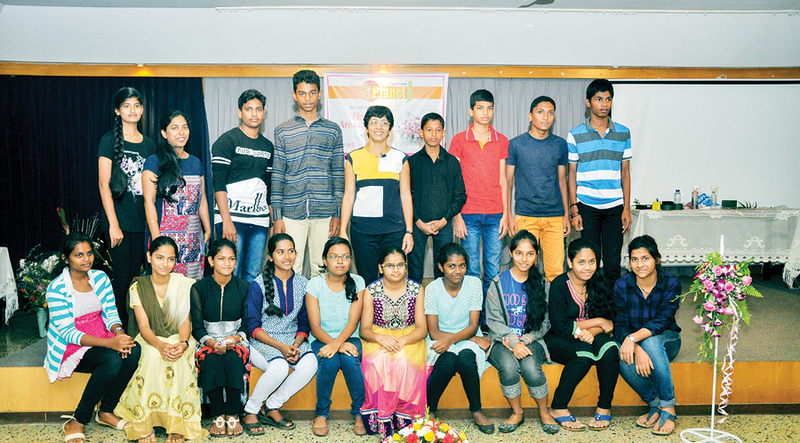 With an eager attitude to gain some knowledge on the skills of floral arrangement and design, 69 enthusiastic students along with some parents and teachers attended The Navhind Times Planet J workshop on November 20 at the Dempo House in Panaji. The three-hour workshop aimed at giving youngsters tips on how to create simple flower arrangements that could increase the aesthetic value of any surroundings they were placed in. Conducted by floral designer Lynette Alphonso, the workshop was an attractive mix of learning and fun with students’ creativity shining through in the practical session. The workshop commenced with an introduction by Alphonso on the itinerary of the workshop and she then went on to explain the basic requirements to make simple arrangements. “Floral foam or Oasis as it is commonly called, flowers and foliage, a container or vase and a sharp pair of scissors is all that it takes to make an arrangement. Once you get the hang of it, you can then experiment with other materials and there is no end to what you can achieve with your creativity,” she said. The demonstrations that followed had participants glued to the screen. Alphonso began with a triangular arrangement and using gladioli for the framework, her deft fingers within minutes created a beautiful arrangement that also utilised gerbera, carnations and roses. “This type of arrangement is used for a buffet or in a corner or side table and has a 3-dimensional effect due to the manner in which the flowers and foliage or fillers are placed,” she said. Next on the agenda was a round arrangement followed by long low banquet style arrangement, wall hanging, miniature, L-shaped arrangement, single flower arrangement and a glass arrangement. Throughout the session she gave invaluable tips on how to care for and condition cut flowers and use different accessories. “Today the market is flooded with the latest and very useful accessories that can not only retain flowers longer but also enhance their appearances,” she said. She then demonstrated various products like gold and silver sprays, sheen enhancing spray, wires, ribbons and more. After the demonstration, participants were more than ready to try their hand at what they had learnt from Alphonso; who went from table to table teaching the youngsters how to go about making the various arrangements she had demonstrated. The participants who had brought their own flowers also took advantage of Alphonso’s stock of flowers which included lilies, alpinia, birds of paradise, chrysanthemum, gypsophila, blue daisies and more. Participants had a great time creating some very attractive arrangements and everyone appeared absolutely engrossed in their creative pursuit. The workshop ended with certificates of participation being presented to participants by Alphonso. Thanks Navhind Times for the wonderful opportunity to a wonderful and useful workshop. It was a wonderful workshop and I enjoyed every minute of it. Dear Navhind Times, thank you for a great show! Such a beautiful event. Thanks ma’am Lynette. It was an interesting and useful workshop and I learnt a lot. Had an amazing time at the very useful workshop. The workshop has made me recognise the importance of floral decorations and taught me how to make some beautiful arrangements. It was an amazing session and I enjoyed thoroughly and learnt many new things. Lovely workshop and I would like to attend more of your workshops so please call me. A truly worthwhile workshop and Lynette even showed us how to use garden plants in a floral arrangement. Flowers speak the language of love and I had a great time learning how to make some lovely creations. The workshop was great fun. It was a wonderful workshop and I learnt all the basics of flower arrangement in full details. Well explained! Thank you. I learnt something new and interesting. It was a good session, extremely enjoyable and learnt so much about floral design. It was an interesting session and the best part was the practical session. I feel so encouraged and motivated to try my hand at making arrangements after this workshop. Thanks Navhind Times and I hope to come for many more workshops organised by you. It was a great experience! Thank you so much. I was bowled over by the simple way ma’am made the beautiful arrangements. It was an awesome experience learning the beautiful art of floral arrangement. It was a lovely opportunity especially for the youth to learn the art. We all got to learn so much and will definitely put it into practice. It was a good experience and I enjoyed a lot. The workshop was a pleasure for the mind and a feast for the eyes. It was a very useful and fun learning workshop. The workshop was a great inspiration for me. Thanks Planet J for organising such a wonderful workshop. Whenever I am around flowers I forget my worries and tensions. I enjoyed the workshop and look forward to more. It was a fantastic workshop and I am so glad I was part of it. Eagerly awaiting the next workshop by Planet J.